I wore a slinky emerald green dress you might recognize from my recent Haul-iday Party Dresses post and simple black heels. 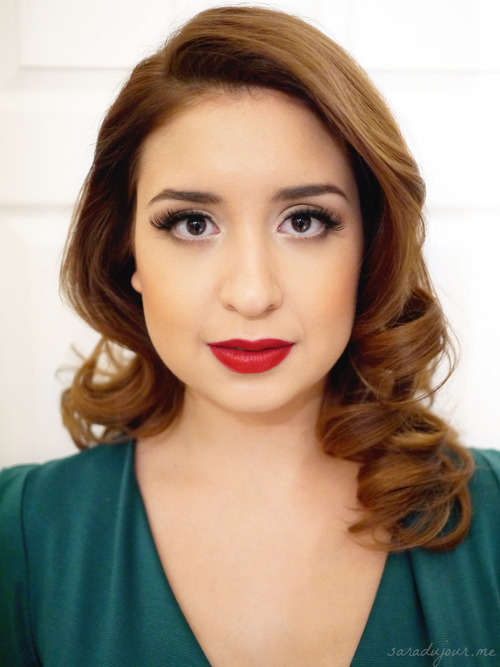 Since the dress is very 1940’s retro, I decided to do forties makeup, hair, and nails to go along with it. Big, soft curls, ruby nails, fluttery lashes and matte red lips. 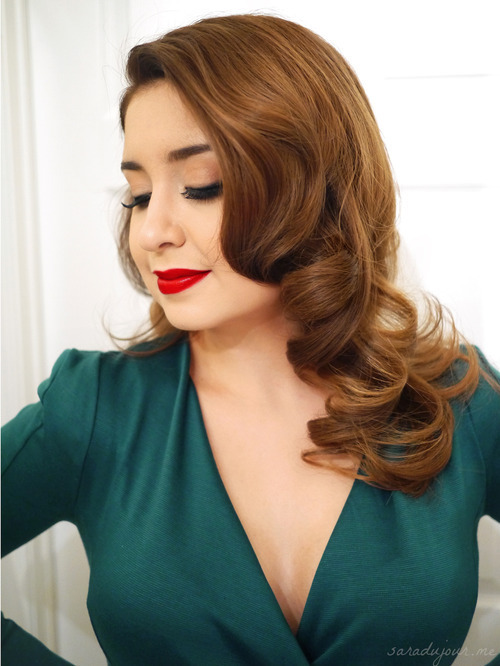 Old Hollywood glamour tops the list of my favorite going-out looks, and I love recreating it. Since this particular outfit is red and green, it’s perfect for the Christmas season too! The dress is quite va-va-voom on its own, so I skipped jewelry completely. I left my hair to the pros, because I knew I’d make a big ol’ mess of it if I attempted it myself (like my last birthday). I brought in a of couple reference photos to show my stylist what I was looking for, and she did a great job. You can get the dress online from Lulu’s: it’s called the “Foreign Film” dress, and it comes in several colours. (This one is Hunter Green.) Lots of compliments guaranteed! Enormous lashes (Quo falsies – no human grows ‘em like that! ), top-heavy black winged liner, a bit of bronzer and peachy blush on the cheeks, and red lipstick. It was a great night filled with my closest friends and lots of laughter. On Tuesday, my actual birthday, I get to spend the whole day with my family.